Laboratory quality tubing. Good chemical resistance. For transfer of all inorganic chemicals. Soft and flexible ( Shore A 55 ). Very well suited for use in peristaltic pumps. Stable against aging and oxidation. Fluran * is a Fluorelatomer with high chemical stability against aromatic hydrocarbons, chlorinated hydrocarbons and strong acids. For laboratory applications. Good chemical resistance. For transfer of nearly all inorganic chemicals. Soft and flexible ( Shore A 55 ). Very well suited for use in peristaltic pumps. Stable against aging and oxidation. 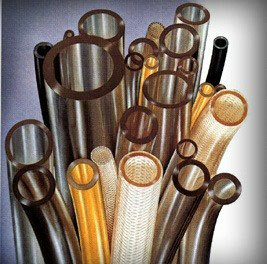 Inert tubing with top chemical resistance from FEP lining. Offers typical Tygon glass transparency, flexibility and excellent bending-radius. Absolute resistance against strong or weak acids, alkalis, solvents or fuels. Ideal for applications in the food and drink industries, chemical industry, medical instrumentation, packaging and filling plant. Not suited for use in peristaltic pumps. Ideal for use in medicine, laboratory and research. High continuous bending stability. Non-toxic, biocompatible, may be repeatedly sterilised. Conforms to USP CLASS VI and FDA food fastness requirements. Ideal for use in peristaltic pumps. Highest quality laboratory tubing. Very smooth inner surface. No adhesion, no diffusion. MEK resistant, suitable for all solvents. Unplacticised. No water retention or release. Minimal gas release, no contamination of gas samples. Absolutely free of smell or taste. For industrial applications, especially pharmacy, cosmetics, laboratory analysis and diagnostics, nuclear medicine processes and for use in sterile filling and dispensing systems. Tygon 2275 is available for the food and drink production. It is FDA approved, USP CLASS VI. Translucent yellow, flexible ( Shore A 57) . from -75 ° C to + 130 ° C.
Ideal for use in the food and drink industry in high temperature areas. Available in dimensions from 1,6 bis 9,5 mm ID. Top chemical and temperature resistance and stable against weather, ozone and UV. Stability against strong acids, alkalis and solvents. Laboratory tubing composed of silicon with netted platinum. Especially smooth surface. FDA approved, USP CLASSD VI.